WELCOME! 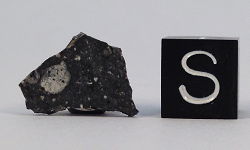 Spacerox offers the finest quality meteorites from the Moon and Mars for sale. Spacerox is operated by Mickey Law, a zoologist with a passion for meteorites who has been studying space rocks since 1982. He has been a member of the Meteoritical Society since 1998 and is IMCA member #2164. PLEASE NOTE: You can click on the Moon or Mars images above for some historical background on these amazing planetary meteorites. 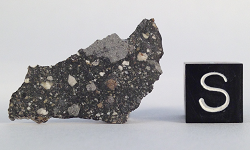 NWA 2977 is an extremely rare lunar meteorite; it is actually a piece of rock from the Moon! It is not a breccia. When molten basalt cools very slowly, it forms a rock with unusually large mineral crystals called a gabbro. A gabbro has the same chemistry as molten or quickly cooled basalt, but its crystals are much larger. In this case, a basalt intrusion most likely cooled very slowly in a dyke or sill fissure within the Moon’s anorthosite crust. With just a simple magnifying glass, you can easily see hundreds of absolutely gorgeous crystals: yellowish green olivine, light gray high calcium pyroxene, and darker gray low calcium pyroxene. This piece of Moon rock is truly awesome! Click photo to enlarge. NWA 6355 is chemically indistinguishable from the regolith samples returned from the Apollo 16 landing site! In addition, data from lunar orbit chemical mapping of the Moon’s surface very strongly indicates this meteorite actually was ejected from some area on the bright highland peninsula between Mare Nubium and Mare Nectaris. This means that you could look up at the Moon and point to the area where this meteorite almost certainly originated! That would be quite an unusual experience with a lunar meteorite. With a magnifying glass, many dozens of anorthosite clasts are visible on both sides; and fusion crust is present along the bottom edge. Click photo to enlarge. NWA 2995 is a jaw-droping spectacular lunar meteorite! And it looks exactly like a lunar meteorite should look! In addition to the very obvious 7mm anorthosite clast, there are dozens of huge 1-2mm anorthosite clasts that are easily visible with the naked eye. With a simple magnifying glass, hundreds more smaller anorthosite and basalt clasts are seen in an ultra fine grained basalt matrix. Chemical mapping from lunar orbit suggests this may not be mare basalt. It is thought to instead be basalt magma that erupted through fissures in the outer rings of the far side South Pole-Aitken impact basin. This would definitely be the showpiece in any meteorite collection! Click photo to enlarge. NWA 8277 is a fantastic naked eye example of both a mingled breccia and a regolith breccia. 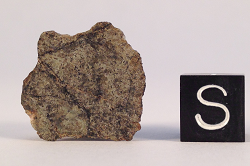 Both of these breccia types are formed near the lunar regolith surface; and their main characteristic is multiple breccias contained within another breccia. The large 5mm clast seen near the center shows two white plagioclase clasts and many greenish brown olivine clasts contained within a grayish brown pyroxene clast. To the left is a 4mm plagioclase clast with olivine clasts within it. To the right are two 1.5mm anorthosite clasts with pyroxene clasts within them. This is the perfect meteorite to illustrate "breccias within a breccia" without the need of a microscope. Click photo to enlarge. 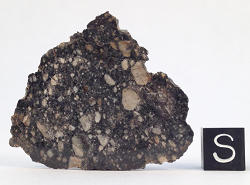 NWA 482 is an extremely rare lunar meteorite because it contains only highland anorthosite crust minerals! It contains absolutely no detectable basalt minerals! Any black mineral grains seen are impact melted plagioclase. This mineralogy certainly indicates it is from the Moon's far side. NWA 482 also contains no regolith materials and was likely never near the lunar surface. It contains only deep anorthosite crust minerals that have been crushed together and remelted by countless impacts. Fusion crust is visible on the angled edge of this specimen. NWA 482 is an extremely rare lunar meteorite and it may actually be unique in containing only deep highland crust materials! Click photo to enlarge. NWA 8609 is a terrific lunar highland meteorite to examine with only the naked eye. It shows more than a dozen 2-5mm anorthosite clasts and countless smaller clasts. There are also a few 3mm size pyroxene clasts and some melt glass to see. Many of the larger clasts are themselves breccias containing olivine clasts within them. The huge clasts plus very little melt glass indicate this meteorite is from deeper in the regolith and was not part of the top surface regolith. This is the ideal lunar meteorite to enjoy with just the naked eye, but you can use a magnifying glass to view this meteorite again and again; and each time you will see clasts and crystals you never noticed before! Click photo to enlarge. NWA 11273 is a stunning lunar highland breccia! The numerous 1-3mm pure white plagioclase clasts stand out among the dozens of other large anorthosite, olivine, and pyroxene clasts. Many of these anorthosite clasts also contain olivine or pyroxene breccia clasts within them; and a few small broken bits of melt glass are visible. 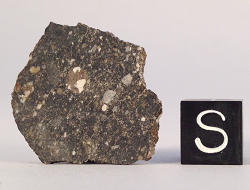 The large size clasts plus the near absence of melt glass indicates this meteorite's origin is from deeper in the lunar regolith and not from the surface regolith. There is 60-75% fusion crust remaining. This is a spectacular lunar meteorite to the naked eye, but you will be amazed at how much more exciting it is to explore with a simple magnifying glass! Click photo to enlarge. NWA 8682 is an absolute joy to examine with a simple magnifying glass! It is officially a feldspathic breccia, but it could be classified as a regolith breccia because almost all the clasts it contains are themselves breccias. The obvious 4mm white anorthosite clast contains gray olivine and black pyroxene clasts within it. Several smaller anorthosite clasts with olivine and pyroxene clasts within them are very easy to see with a magnifying glass. A magnifying glass also reveals at least a dozen 0.5-1mm olivine clasts containing pyroxene clasts within them. A large number of clasts that are actually breccias within a breccia definitely indicates an origin very near the surface of the Moon. Click photo to enlarge. NWA 10822 is truly a gorgeous example of what the surface of the Moon actually looks like! Many dozens of 1-6mm white plagioclase clasts, and at least a dozen 1-2mm orange brown pyroxene clasts are easily visible to the naked eye. In many cases, bright shock melt plagioclase glass seems to outline the large clasts in black for accent. One side is polished to a very high gloss, while the other side remains completely natural. Only a few small nicks prevent this from being a complete slice, and 90% or more of the fusion crust remains. If you were walking on the surface of the Moon and looked down, this is exactly what you would expect to see beneath your feet! Click photo to enlarge. NWA 11474 broke into many small fragments without fusion crust as it entered Earth's atmosphere. This is one of those fragments that has not been wire brushed, polished, or cut. It has been left just as it appeared when it fell to Earth. At least two dozen 1-3mm anorthosite clasts are easily visible with the naked eye, and shock melt glass surrounds many of these clasts. 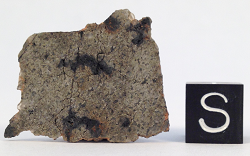 This fragment was still quite hot when it landed in the Sahara Desert sand, and some of the brown or tan desert sand melted and fused onto the meteorite's surface. If you came upon this fragment in the desert, picked it up and wiped it clean; this is exactly what you would be holding in your hand. Click photo to enlarge. NWA 11474 broke into many small fragments without fusion crust as it entered Earth's atmosphere. This is one of the larger fragments that has been sliced in half to expose its interior. 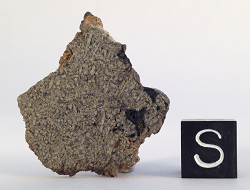 These fragments were still hot when they landed in the Sahara Desert, and some of the brown or tan desert sand melted and fused onto the meteorite's surface which can be seen on the back of this specimen. On the polished interior face, more than a dozen 1mm or larger anorthosite clasts are visible with the naked eye; and shock melt glass plus dozens more anorthosite clasts are revealed with just a simple magnifying glass. This is a great example of a typical lunar highland breccia. Click photo to enlarge. NWA 998 is an extremely rare example of a Nakhlite and one of the very few available to collectors. Its dark olive or black pyroxene crystals and light olive or tan olivine crystals are easily seen without magnification. 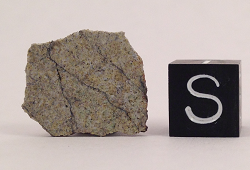 The serpentine surfaces of the olivine crystals definitely indicates this molten rock interacted with water; and the large crystal size indicates an extended cooling period in a thick lava flow. These very obvious features strongly suggest this liquid magma interacted with steam in a volcanic eruption and then slowly cooled in a thick lava flow near a shield volcano on Mars. 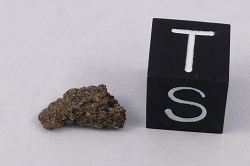 As is typical of Nakhlites, this sample is friable and not suitable for group viewing or rough handling. Click photo to enlarge. NWA 6963 contains gigantic pyroxene crystals that are actually eight times the size by volume of typical Shergottite crystals! It also shows many large transparent quartz crystals. A typical Shergottite is thought to result from magma that erupted from a fissure in the Martian crust and then flowed onto the surface where it quickly cooled. But the huge crystals in this Shergottite suggests it remained within the fissure where it cooled more slowly and did not erupt onto the surface. 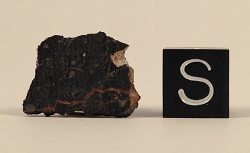 The large shock melt glass bubble in this specimen would have preserved a sample of Mars atmosphere and then released that Martian atmosphere into the room when the saw blade cut this slice! Click photo to enlarge. Zagami is considered to be the typical Shergottite; and it was the first Martian meteorite available to collectors. Shergottites are thought to result from magma erupting from a fissure in the Martian crust and then moving in a shallow flow across the surface where it quickly cools. 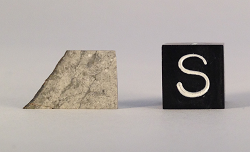 This typical slice shows how solidified pyroxene crystals are oriented in the somewhat general direction of flow. Tiny cracks in the rock are visible as plagioclase shock melt glass veins, as seen on the right side of this slice. Any cracks in contact with the Martian surface when the meteorite's ejection impact occurred will have Mars atmosphere preserved within shock melt glass vein bubbles! Click photo to enlarge. Tissint is identical to the Shergottite EETA 79001, which is the meteorite containing Martian atmosphere in impact melt glass bubbles that proved all SNC meteorites are from Mars! Both of these Shergottites are also unusual in containing olivine in the form of giant megacryst clasts. Two of these 1.5mm broken olivine megacrysts are exposed on the top left of this specimen; and the typical Shergottite pattern of pyroxene crystals is seen over the entire surface. All of the visible plagioclase impact melt glass bubbles were broken open when this sample fragmented, but it is certainly possible there are intact melt glass bubbles in the interior that still preserve Mars atmosphere! Click photo to enlarge. NWA 7397 is chemically classified as a Shergottite, but looks completely different. There are none of the typical cigar shaped pyroxene crystals in a flow pattern. Instead, there are big 1-2mm rounded pyroxene crystals containing olivine crystals. There are also many large transparent quartz crystals present, as well as plagioclase shock melt glass veins. The large crystal size, presence of crystals within crystals, and melt glass veins strongly suggest this meteorite may have originated from a magma chamber near the Martian surface that experienced multiple periods of cooling and remelting. This end piece has 85-90% fusion crust, and can be safely handled for group viewing. Click photo to enlarge. NWA 2975 contains all the expected large pyroxene, olivine, and quartz crystals; but more importantly, this particular slice perfectly illustrates how Mars atmosphere is preserved inside impact melt glass. The tiny crack that runs vertically from the top surface down the middle of the slice has two truncated branches. This crack was filled with Martian atmosphere when the ejection impact occurred, and the shock wave melted plagioclase into black glass as it passed through the crack. Mars atmosphere was trapped in both dead end cracks and became enclosed inside glass bubbles. When a saw cut this slice and those glass bubbles, the preserved Martian atmosphere escaped! Click photo to enlarge. TO ORDER: Send us an email with the catalog number, meteorite name, and your mailing address. We will reply with confirmation that the meteorite is still available and you will receive an email Invoice from PayPal requesting payment. Once payment has been verified by PayPal, your space rock will be on its way to you. The prices shown in our catalog are in US Dollars and include Priority Mail shipping within the US. The buyer pays any additional costs for orders shipped outside the US. Full payment in US Dollars must be verified by PayPal before an order is shipped. Delivery liability for Spacerox ends when delivery is verified at the buyer's mailing address by the US Postal Service or other parcel carrier used by Spacerox. Please understand that all sales are final. Spacerox does not sell meteorites on approval. It is your responsibility to be certain the meteorite you purchase is the meteorite you want. Spacerox guarantees the meteorite you receive will be exactly the meteorite shown and described in the above catalog. You are welcome to request additional photos or descriptive information before making a purchase, but Spacerox does not accept returns.